Whenever I read tweets and blog comments about UTM parameters, I feel that there’s a lot confusion around them. It may be because UTM parameters are so deceptively simple. They are just a set of five parameters (utm_campaign, utm_medium, utm_source, utm_term and utm_content) that you can add to your URLs and get so much more insights in your analytics reports. These parameters do a lot of work and are interpreted in very specific ways in Google Analytics. 1. Will tagging URLs with UTM parameters affect search rankings of my website? Short answer: No. It will not affect search rankings of your website in any way. It will neither improve your website’s search rankings nor will it degrade it. Long answer: Google (and even Bing) knows that UTM parameters are used for tracking. It ignores them when crawling websites. That being said, there have been some instances in the past where links with UTM parameters have shown up in search results. However, those are anomalies and most websites are indexed correctly. in the <head> section of your website. This tells Google to always use http://yoursite.com/sale in search results. This will make sure that any parameter you add to your URLs (UTM or not) won’t affect how your website is shown in search results. 2. Should I use UTM parameters for internal links on my website? Let me tell you with an example why it’s such a bad idea. Let’s say you published a new blog post, An Awesome Way to do Something Awesome. You shared it on Twitter. One of your followers clicks on the link and arrives at www.yoursite.com/blog/awesome-post. When they are done reading, they want to go to your home page. They click on a link that takes them to http://www.yoursite.com/?utm_source=blog. You just lost the information that the user came from Twitter. Your analytics report will say that the visitor came from blog and not from Twitter. If you want to know what visitors are doing on your website, use the capabilities of your analytics tool. It most likely has some report/tool that lets you get this information. Use that for internal tracking. e.g. 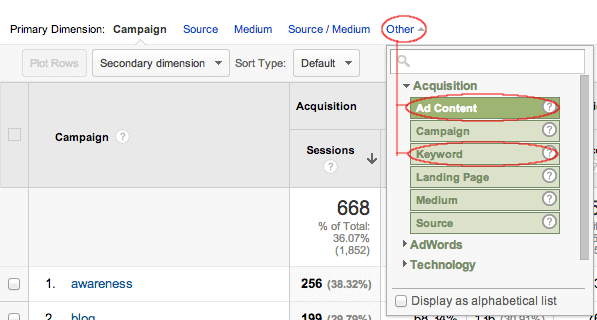 Google Analytics provides event tracking for user actions. 3. Does custom UTM parameters affect the in-built reporting on social referrals? If a URL doesn’t have UTM parameters, Google looks at the referring URL and matches it against a list of hundreds of websites it believes are social networks. If there’s a match, the visit is attributed to social traffic. If a URL does have UTM parameters and utm_medium is either social, social-network, social-media, sm, social network, or social media, then the visit is also attributed to social traffic. So it’s very important to use the right value for utm_medium. Remember, ‘twitter’ is not a medium. It is a source. If a URL does have UTM parameters and utm_medium is not one of the above mentioned values, it won’t be counted as a visit from a social network. It will, however, show up in other traffic reports, e.g Campaigns report. 4. Do UTM parameters make a URL less trustworthy that gets fewer clicks? It depends on your particular scenario. Instinctively, short URLs with little to no visible tracking information feel more trustworthy and clickable. But before coming to any conclusion, you should A/B test both scenarios (with and without tracking information). However, you can also hide the ugly long URLs in some cases. Using shorteners (e.g bit.ly) is a good way to hide tracking information. Shortened URLs are much more acceptable when sharing on social networks. In emails, you can use a call-to-action anchor text to mask the tracking URLs. In addition, you can also use shortened URLs. Tip: You can also do a little cleanup once a visitor lands on your website. Use Wistia’s Fresh URL script to dynamically remove any UTM parameters from the URL after Google Analytics has had a chance to log the information. 5. 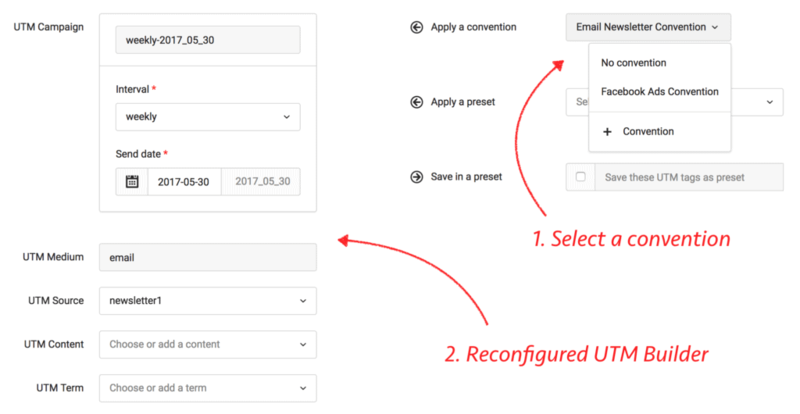 Where do I find data for utm_term and utm_content in Google Analytics? In most Google Analytics reports, you can see a row with Primary Dimension followed by several links. The last one is usually marked Other. Click on it and then click Acquisition. You will see Ad Content which corresponds to utm_content. Similarly, Keyword corresponds to utm_term. 6. Should I add a slash (/) when tagging my URLs with UTM parameters? This question basically asks if you should use http://www.example.com/?utm_source=twitter (/ before ?) or http://www.example.com?utm_source=twitter (no / before ?). Before I give you my answer, copy each of these two URLs and paste them in your browser. What do you see? You will see that the browser added a slash to the URL even when there was no slash. It doesn’t affect anything if you don’t add a slash. But since adding it is a convention (even by a modern browser), let’s just stick to it and add it any way. 7. Is there a character limit for each of the UTM parameters? There’s no inherent character limit on the UTM parameters. But there are a couple of reasons why you should keep them fairly short. Without going into the technical details, a URL that has fewer than 2000 characters will work with any combination of browser and web server. So even though there’s no limit on any individual UTM parameter, collectively, along with the destination URL, there’s a limit of about 2000 characters on the final URL. It’s a good practice to keep the UTM parameters short and meaningful. They need to make sense in reports, charts, etc. They should look good and intuitive. Knowing all the issues around using UTM parameters is only the first step.